As a luxury real estate marketing professional do you find yourself relying on the same sources of business to sustain your practice? It is easy to get complacent. But, by staying on this course you run the risk of getting stale or even stagnant. One of the key habits of successful market leaders is staying sharp by continuously reaching for new channels of creativity. Sometimes new paths simply appear and you just need to move forward. But, sometimes it takes consistently chipping away to open a new channel of business. Other times it may even require a bulldozer to clear the way. We discovered a perfect metaphor for this that we wanted to share with you. 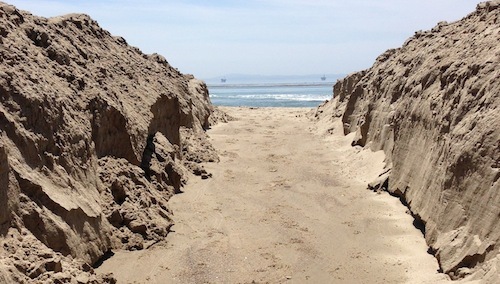 Recently, while taking a walk on our Carpinteria beach here in Santa Barbara, California, we encountered an unusual phenomenon. The latest tides washed up a surplus of sand that blocked the “ever-present” channel between our salt marsh and the ocean, which threatened the entire ecosystem. It has occurred only five times in the last fifteen years. Adjacent to our sandy beach, sub tidal rocky reef, and kelp beds is the Carpinteria Salt Marsh Reserve. It contains a critically important Southern California estuary, which supports many sensitive plant and animal species. The site includes extensive wetland, sub-tidal channel and emergent upland habitats. The reserve provides habitat for migratory waterfowl along with several species of plants and animals listed as endangered, threatened or of special concern. When this blockage occurs members of the Land Trust of Santa Barbara County and several volunteers work together to open a new channel between the marsh and the ocean. Please take less than one minute to watch the video we created to document this process. Find ways to open up new channels of creativity and business. To gain or sustain market leadership you constantly need to keep your creative juices flowing by trying new things.